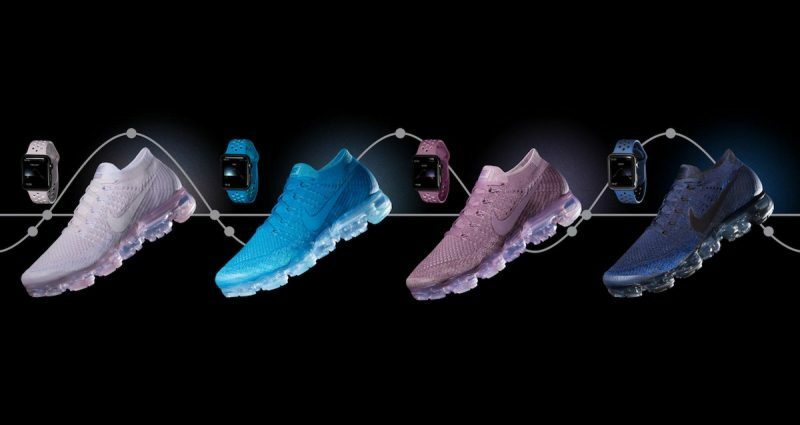 Nike today announced four new Apple Watch bands for Apple Watch Nike+ that will match the Nike Air VaporMax Flyknit "Day to Night" collection of shoes. The company said that the new colors of bands and shoes are "inspired by a shade of the sky, from dawn to dusk," and mark the first time that Apple Watch owners can directly match their band choice to their Nike sneakers. Similar to previous Nike+ Apple Watch bands, the new options are made of the same flexible fluoroelastomer material that Apple uses in its own Sport bands, but include a perforated design for ventilation and sweat management. The most recent Nike and Apple partnership was in the cream and black NikeLab band that launched in April, following the first Apple Watch Nike+ device that debuted last September. Users will be able to purchase the new Nike Apple Watch sport bands for $49.00 each beginning on June 1 on Nike.com and in select Nike stores. The company said that the bands will be available on Apple.com, in Apple retail locations, authorized resellers, and specialty department stores from "early June." The running shoes will also go on sale on June 1, and will be priced at $190.00. 5 cent bands sold for $50 to go along with 20 cent shoes sold for $200. They look great, but I just can't fathom paying that much money for some cloth and rubber. Are you somehow trying to convey there are differences in the chemical composition between fluoroelastomer and some common rubber to justify Apple's application of the material as a watch band in addition to its $50 price tag? Who cares about the price tag. If someone wants to pay $50.00 for the Watch band, so be it. What is apparent is you don't understand the differences between rubber and flueroastamer. "Fluoroelastomer comes from the two words "fluorinated" and "elastomer". Fluoroelastomers are famous for their durability resistance to heat, oils, solvents and fuels. They are often used for fuel-distribution systems or for high-quality lab gloves. It is not a material that will stretch out easily, get damaged by extreme heats, or get deformed by being excessively sweat on. It is also much less prone to induce any allergic reactions than, for example, latex." Where as rubber, doesn't have the consistency and durability as Flueroastamer does. Flueroastamer easily is the preference For fitness for reasons stated above. Yes, Apple just threw a dead cow to a lake filled with pirañas. Sold on the midnight blue Nike Band. Nice to see additional colors in these. The perforated design is much more efficient for work outs. They aren't "rubber", nor do they cost $0.05 to produce. Pretty easy to see this when comparing Apple bands to ones purchased from Amazon or Best Buy. It's an extremely noticeable feel and durability difference. The sport bands I bought with my first gen watch are still going strong. There ARE differences in the chemical composition, which create significant differences in the look, feel, flexibility and durability of the Apple/Nike bands. No justification is needed. You either like it and see the value, or you don't. Why are so many people on this forum threatened by this watchband? It's really strange. It's also strange that anyone would spend $400 or $800 on a watch, and then buy the cheapest band for it they can find. That's akin to buying a brand new Audi and then scouring EBay for the cheapest knock-off tires available. You either appreciate quality or you don't. But no reason to judge those who do. These are not for me, but I'm already tired of comments by people who haven't sold a million of anything hating something because it's a different colour, or whatever non-reason that doesn't affect their lives. Exactly. I love how Apple uses "fluoroelastomer." Oh my God, just say "rubber." It's a rubber band. Nothing special about "fluoroelastomer." And I bet it really does cost 5 cents. But since it has a giant Apple logo on it, people buy it. Just like Glock guns. They're plastic. But they use "polymer nylon something." Just say plastic. You've obviously never used one, and then tried a knock off. They are not in the same universe when it comes to quality or feel. Edit: My day-1 sports band still feels great, but some pricey knock-offs I bought from Amazon lasted less than a month before they started to shine and feel terrible. Well worth the cost for the real thing. You just described absolutely all of Apple's 1st party accessories. All over priced crap. I don't fully agree though. I've tried a lot of the aftermarket rubber straps, each time hoping to find that one that rivaled the original rubber strap. They're all made of crap silicone rubber. My Apple rubber strap still looks like new and keeps holding up. It's just decent stuff.